During its trans-Atlantic voyage of September 6 – November 9, 1620, the majority of them becoming the settlers of Plymouth Colony in what is now Massachusetts. Of the passengers, 37 were members of the separatist Leiden congregation seeking freedom of worship in the New World. The Mayflower launched with 102 passengers, as well as at least two dogs, and a crew of 25-30 headed by Captain Christopher Jones. One baby was born during the trip and named Oceanus Hopkins. Another, Peregrine (meaning “wanderer”) White, was born on the Mayflower in America on November 20, before the settlement at Plymouth. About half of these emigrants died in the first winter. 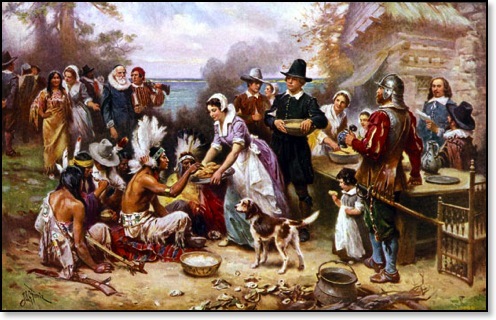 Many Americans can trace their ancestry back to one or more of these individuals who, ‘Saints’ and ‘Strangers’ together, would become known as the Pilgrims. After hearing the news that we are Mayflower material, my daughter suggested that we visit a Native American Casino this Thanksgiving and play Black Jack. In doing this, we will probably return whatever share we stole from the Native Americans in the first place. Perhaps a little bit more. I have all of the documents for proof, I just need to sit down & fill out the forms.